Smart metering is all the rage when it comes to electricity. But what about metering water? Many muncipalities still rely on flat-rate pricing of water to supply freshwater and collect sewage. Flat-rate pricing makes sense only when the commodity itself is not not in short supply. However, when water becomes scarce, pricing needs to reintroduce the economics of balancing supply and demand. What does economics tell us about the price of water? The economics of metering is simple. If the marginal price of water is zero, consumers will not conserve water. If the margin price is equal to the marginal cost of providing and delivering water, then consumers will take approrpriate action to conserve water. Volumetric pricing thus reduces the amount of water use, while flat-rate pricing does not. The diagram above shows the economics of water supply from a reservoir, as is typical in the Lower Mainland of British Columbia. If water use is well within the capacity of the reservoir, the price of water reflects its physical supply cost: the cost of the infrastructure for storing and distributing the water, and the cost of collecting and treating sewage. Only when water use reaches the capacity limit of the reservoir will the price of water reflect scarcity, and the price will need to climb to balance fixed supply and growing demand. Scarcity is closely related to population growth. 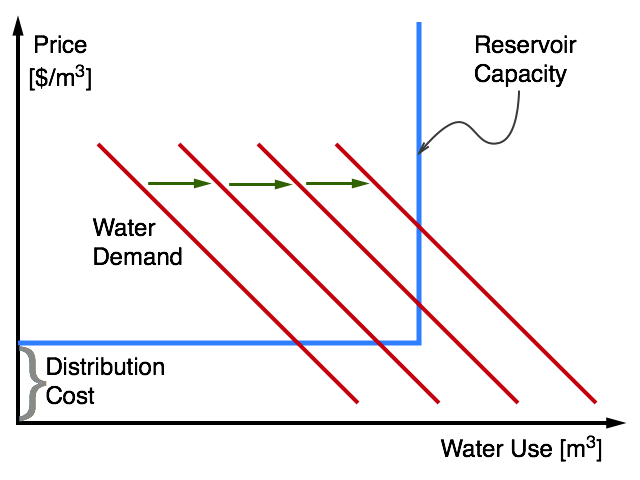 If water use reaches the reservoir capacity (the corner in the inverted "L" in the diagram), water pricing needs to adjust. Economics also tells us about free riding. If you face no additional cost for using more water, you do not care about how much water you use. Any increase in overall supply costs is shared by all other users. Thus, flat-rate pricing encourage overuse even when there is no physical scarcity because the marginal cost of supplying water is positive. Volumetric pricing and flat-rate pricing can both be used to adjust demand, and thus the question is about efficiency. Flat-rate price is cheaper to administer because it does not require metering—and the related cost of installing and reading the meters. Volumetric pricing is more efficient because water uses face the full marginal cost when increasing their water use. With flat-rate pricing, the effective marginal cost is zero. Switching from flat-rate pricing to metering goes hand in hand with population growth and the resulting increases in water demand, as well as decreases in water abundance due to climate change. What is the cost introducing metering? Metering introduces two new costs: buying and installing the meters, and monitoring and maintaining the meters. The high installation cost of the meters was the main reason why flat-rate pricing has remained more attractive. There are different types of meters, of course. Conventional analog meters are cheap but must be read manually. Modern digital meters can be read wireleslly. Generally, water meters last about 20-30 years. How can one transition effectively to water metering? There exists opposition to water metering in a number of quarters. Some groups oppose metering on the basis that there exists a "human right to water" and that metering would infringe on that right. Of course, this argument is nonsensical as water is priced already, just not volumetrically. Others oppose metering because they know they over-use water and are subsidized by all the other rate payers. Some are also worried that meters will increase profits of water companies, not realizing that water supply in most municipalities is under public ownership and not private ownership. Municipal water utilities have a mandate to cover cost, but they do not make profits. From a practical point of view, metering can be introduced through voluntary participation. There will be significant uptake of voluntary metering because about half of all users pay too much for their water and subsidize the other half of users. The "frugal users" are the first to adopt metering, as it will save cost. The water utility can subsidize the adoption of metering by offering installation for free. As more and more users shift to metering, the water utility can gradually increase the flat-rate price for the remaining users. Eventually, most users will switch to metering voluntarily. What is the effect of water metering on households? The table below shows how three municipalities in the Lower Mainland of British Columbia are pricing water for households. Shown are the metered rates and comparable flat rates for single-family detached homes. A useful starting point for comparison is to assume that an average single-home household uses about 250 cubic meters of water per year, equivalent to about 650 litres per day. This includes irrigation and is based on data from households on the UBC campus. Metro Vancouver claims that the average household only uses about 340 litres per day (124 cubic meters per year), but this number sounds rather low. Surrey reports an average use of 338 cubic meters annually for households that are metered. Start with the Surrey numbers. With 338 cubic meters per year, a metered household pays $588 per year rather than $1277. This amounts to substantial savings for the average Surrey household that switches to metering voluntarily. Simon Cowan: The Welfare Economics of Optional Water Metering, The Economic Journal 120(545), pp. 800-815, June 2010. Wise Water Use, Environment Canada. Water Pricing, Canada West Foundation, September 2011. Managing Water for All: An OECD Perspective on Pricing and Financing, OECD, 2009; as well as Pricing Water Resources and Water and Sanitation Services, OECD, 2010.